The Singapore Clinical Research Institute (SCRI) is a national academic research organisation dedicated to enhancing the standards of human clinical research. As a wholly-owned subsidiary of MOH Holdings, we strive to improve patient care through the design and conduct of cutting-edge clinical research. The highly experienced scientists and operations team at SCRI works closely with our partners, including leading pharmaceutical, medical devices and biotech, as well as academic Investigators. Many of our research scientists hold joint appointments as university teaching faculty. SCRI endeavours to develop core capabilities and scientific expertise through conducting clinical research training programmes for research professionals. SCRI collaborates with clinicians to develop specific disease and practice-focused Clinical Research Networks. Through the unique fusion of scientific leadership and operational excellence, SCRI offers a comprehensive suite of clinical research capabilities. 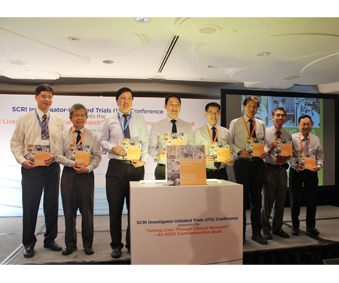 Today, SCRI is also involved in optimising Singapore’s clinical trial landscape through developing numerous National Clinical Trial Coordination Initiatives. The Clinical Trials & Epidemiology Research Unit (CTERU) was established in November 1996 by the Ministry of Health (MOH) with funding from the National Medical Research Council (NMRC). CTERU’s goal was to provide essential infrastructure support for not-for-profit public-sector research. To achieve this goal, CTERU carried out multi-centre clinical trials, epidemiological and evidence-based medicine studies benchmarked to international standards. In September 2008, CTERU was restructured to become SCRI, a national academic clinical research institute. SCRI built on CTERU’s foundation to develop enhanced resources and capabilities to advance intellectual and scientific leadership. Equally important was the focus on providing the necessary infrastructure for collaborative clinical research. SCRI has since been breaking new grounds in its clinical research together with its partners.